15. Karuppasamy R (2000). Tissue histopathology of. Channa punctatus under phenyl mercuric acetate toxicity. Bulletin of Pure and Applied Sciences 9A(2),. Jul 21, 2013 - Uptake of Heavy Metals by Tomato (Lycopersicum esculentus) Grown on Soil Collected from Dumpsites in Ekiti State, South West, Nigeria. sawah padi, dan ikan ini sesuai digunakan sebagai bio-penunjuk untuk penyelidikan ..... Henry F, Amara R, Coucot L, Lacouture D and Bertho M M-L. (2004). Keywords: heavy metals, environment, contamination, legal requirements, ......  Amos RT, Blowes DW, Bailey BL, Sego DC, Smith L, Ritchie AIM. ... rich mine water using sodium carbonate, Journal of Environmental Chemical Engineer- ing. Sep 27, 2017 - powder made from plants.16 Besides these materials, insect pro- ducers in Europe ... media for rearing insect larvae.16 Among resources that could be used as .... reached harvest size (individual larvae weight â¼100 mg; total feed- ..
the effect of metal chelation on CCK by in vivo treatment. 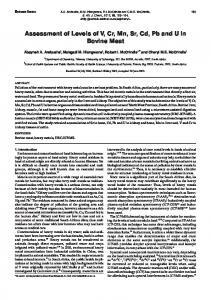 of rats with sodium diethyldithiocarbamate (DEDTC), the ac- tive metabolite of disulfiram (Antabus). vary widely geographically and includethe concentration and chemical form of the element entering soil, .... changes in the total concentration of these elements in soil ... and organic matter. ...... tive Pedology, McGraw-Hill, New York, 1941. 24.
copper produced worldwide, for instance comes from bioprocessing with mesophilic or thermophilic bacteria (Moffet, 1994). Metals in insoluble minerals are solubilized either directly through mineral metabolic activities or indirectly by chemical oxidation brought on by products of metabolic activity, mainly acidic solutions of iron (Marsden, 1992). Most of these bacteria prefer low pH conditions. One of the best-known mesophiles is the Thiobacilli family. These bacteria are capable of catalyzing mineral oxidation reaction (Hughs and Poole, 1989) is the most studied organism relevant to leaching of metal sulfides. This strain of bacteria is most active in the pH range 1.5–3.5, with an optimum pH of 2.3. Even though it is generally recognized that Thiobacillus ferrooxidans bacteria can survive at temperatures ranging from 30–37◦ C, no effort has been apparently made in trying to identify this stain of bacteria in hot climate areas. However, if themophiles can survive in the presence of heavy metals contaminants, their usefulness can be extended to bio-remediation. Leighton and Forster (1998) studied the effect of heavy metals on a thermophilic methanogenic up flow sludge blanket reactor. They showed that lead has the greatest effect on biogas production and, on the basis of the volatile fatty acid production, appeared to act immediately on acidogenesis and move slowly on the methanogenic bacteria. The present work is part of the studies carried out at the U.A.E. University by Al-Maghribi et al. 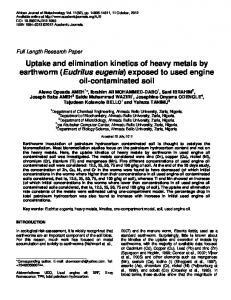 (1998, 1999) and Zekri and Chaalal (2000) in the field of using themophilic bacteria to reduce asphaltene content in heavy oil. The investigation is aimed at the development of a new process for the reduction of lead concentration in drinking water employing the same thermophillic bacteria isolated from the UAE environment. It introduces a novel technique that uses a combination of a membrane system and thermophilic bacteria. The technique was tested and found to remove lead and reduce its concentration to an acceptable level. Material and Methods Bacteria Two strains of bacteria, both belonging to the Bacillus family, were isolated from the local United Arab Emirates hot water streams. The temperature of the water in this region varies from 30 to 70◦ C. These bacteria were the only kind that survived the harsh temperature and salinity conditions prevailing in the environment. Medium The medium growth similar to the medium quoted in reference (Al-Maghrabi et al., 1999) was prepared in 100-ml sterilized bottle. It was composed of 1 ml of indigenous thermophilic bacteria solution, 90 ml of double distilled water. One g of nutrient (extract of yeast powder) was added to the medium. The medium was well mixed, but was not subjected to any further agitation. Also, the culture medium was exposed to different temperature conditions (25–35◦ C). Chemicals Riedel de Haen Germany and Lead (II) acetate supplied by Fluka Chemika Switzerland supplied the Lead (II) nitrate. The stock solutions of lead were prepared by dissolving the chemicals in doubly distilled water and the pH of the two solutions was measured before and after the addition of the bacterial suspension. Figure 1. Schematic diagram of two compartments bioreactor. Figure 2. Schematic diagram of the electrical cell. fixed against the small walls. The box lid was sealed with a neoprene rubber gasket and was held in place by special glue. The lid has two glass ports 0.5-mm diameter fitted with a quickfit screw closure for sampling by means of a siring. Procedure The tests were carried out in 3 steps as follows: Step 1 In this experiment, 90 ml of the bacteria solution containing a known population of bacterial suspension was investigated in the electrical cell. Five volts were maintained across the cell. Samples were withdrawn from the cell by means of a 1 mm syringe near the electrodes via the ports, and microphotographs were taken for these samples at different times in order to visualize the charge of the bacteria type and concentrations at different electrodes. Step 2 This step elaborates the growth of bacteria when the reactor contains a lead solution. For this case, a solution containing 30 ppm of lead was prepared from double distilled water and lead acetate. Both cells of the reactor were filled with approximately 130 ml of this solution then 10 ml of thermophilic bacterial suspension were added into cell 1 (10 ml of bacterial suspension represents a bacteria count equivalent to 12 × 103 cells/ml). In order to maintain cell 1 well agitated, a mechanical stirrer rotating at a speed of 50 rpm (this rate was found suitable for the mixing in cell 1) was introduced in cell 1 at a position located at 62 mm from the top, as shown in Figure 1. The solution of lead in cell 2 was not subject to any agitation. Even though the concentration of lead was high, it was needed to observe biodegradation of lead and the resistance of bacteria to lead. During the entire operation of the reactor, microphotographs were randomly taken from both cells. Samples were withdrawn and tested by atomic absorption for lead content, and were observed under the microscope in order to asses the growth mechanism, as well as to determine the bacteria growth rate and the rate of lead removal. Step 3 This step was conducted to observe the rate of lead removal as function of initial lead concentration. The investigation of the rate of lead removal by the bacteria was carried out in two sets of experiments. The first set implicated the study of four solutions containing initial lead concentration of 7, 12.5, 20, and 30 ppm, respectively. The two cells of the reactor were filled with the same lead solution. A two-ml of bacterial suspension (3 × 103 cells/mil) was added to cell 1, which was continuously agitated. Samples were withdrawn from both cells and analyzed with atomic absorption as function of time. The same batch of experiments were repeated using 10 ml of bacteria (10 ml of bacteria equivalent to 12 × 103 cells/ml). Figure 3. Electron photo of water samples obtained from the bottom of bioreactor at the end of run #1 (×1000). Figure 4. Bacteria concentration at the top of the bioreactor at the end of run 1 (×1000). Figure 5. Microphotograph showing the gathering of the rod-shape bacteria near the negative electrode (×1000). Figure 6. Microphotograph showing the gathering of round bacteria near the positive electrode (×1000). phenomenon leads one to believe that the bacteria are experiencing an adaptation period to the lead solution (adaptation period that lasted for almost 1 hour). After this period, a significant exponential increase in bacteria count has been noticed with a maximum growth equals to 17 ∗ 103 cells/ml after 8 hours followed by a constant growth for the remaining time. At the same time, the lead concentration profile showed an exponential decrease during the first 8 hours, reaching a value of 6 ppm followed by a constant decrease that reached 1.6 ppm after 24 hours. These observations are consistent and prove the existence of a significant transfer of lead from the solution to the bacteria cells if the bacteria can survive for a longer period. Furthermore, these observations also showed that the amount of bacteria in the solution is a limiting factor in removal of lead from the solution. Hence, a higher bacteria count is needed to reduce the lead content to the desired level and to diminish operation period to an accepted time. The same behavior was observed in Figure 6 but at lower magnitude because the bacteria count in cell 2 was very low. Furthermore, the microphotographs 3 and 4 where taken at the end of the process in order to visualize the bacteria presence. Microphotograph 3 shows the bacteria activity at the bottom of cell 1. Note in this microphotograph all the bacteria are observed to be located at the bottom near the membrane. Microphotograph 4 showed few bacteria present at the top of the cell. All the bacteria observed under the microscope were alive and moving around freely in the lead environment. Consequently, they must be lead resistant and responsible of the lead decrease in the bioreactor. Figure 7. [P b] concentration and bacteria growth in cell 1 in 38 ppm P b solution, 10 ml bacteria. Figure 8. [P b] concentration and bacteria growth in cell 2 in 38 ppm solution, 10 ml bacteria. Figure 9. Lead concentration vs. time, P b = 7 ppm 2 ml bacteria (3 ∗ 103 cell/ml). Figure 10. Lead concentration vs. time, P b = 12.5 ppm 2 ml bacteria (3 ∗ 103 cell/ml). Figure 11. Lead concentration vs. time, P b = 20 ppm 2 ml bacteria (3 ∗ 103 cell/ml). Figure 12. Lead concentration vs. time, P b = 30 ppm 2 ml bacteria (3 ∗ 103 cell/ml). Figure 13. Effect of bacteria concentration on lead concentration. Figure 14. The effect of initial cell lead concentration on % reduction of cell concentration, 25 hours basis. initial lead concentrations and amount bacterial. The system exhibits a small reduction in lead concentration at a low initial lead concentration of less than 7 ppm. At initial concentrations higher than 7 ppm, increasing the initial lead concentrations resulted in a significant reduction of lead concentration for both bacteria populations employed in this study. The optimum initial lead concentration for the system containing 2 ml of bacterial suspension was around 13 ppm and corresponds to 92% reduction in lead concentration. On the other hand, when the bacterial suspension was increased to 10 ml the optimum initial lead concentration for the same percent of lead removal of the system was found to be around 35 ppm. Conclusion A novel technique was developed in this project for water purification of lead. Laboratory studies showed that the bioreactor has the potential for significant reduction in equipment volume and weight and also in its simplicity compared to other devices used to remove heavy metals from water. Performance is dependent on the lead concentration and amount of bacteria used in the experiment. References Aladhab, H. E., O. Chaalal, and M. R. Islam. 1997. A novel water purification technique. 2nd Annual Conference on Water Technology and Environment, Doha, Qatar, Dec. Al-Maghrabi, I. M. A., A. O. Bin Aqil, O. Chaalal, and M. R. Islam. 1999. Use of thermophilic bacteria for bioremediation of petroleum contaminants. Energy Sources 21:17–29. Al-Maghrabi, I. M. A., O. Chaalal, and M. R. Islam. 1998. Thermophilic bacteria in UAE environment can enhance biodegradation and mitigate wellbore problems. SPE 49545, Proc. SPE ADIPEC 98, Abu Dhabi. Amphelett. C. B. 1964. Inorganic Ion Exchanges. Amsterdam: Elsevier, 38–41. Avery, S. V., and J. M. Tobin. 1992. Mechanisms of strontium uptake by laboratory and brewing strain of Saccharomyces Cervisiae. Appl. Environ. Microbiol. 58:3883–3889. Chang, D., K. Fukushi, and S. Ghosh. 1995. Simulation of activated sludge culture for enhanced heavy metals removal. 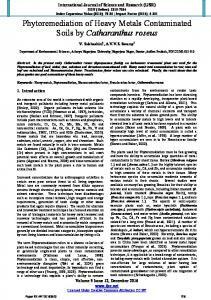 Water Environmental Research 67:822–827. Environ. 1988. Element of Toxicology and Chemical Risk Assessment. Washington, DC: Environ Corporation. Gilbert, S. R., C. O. Bounds, and R. R. Ice. 1988. Comparative economics of bacteria oxidation and roasting as a pre-treatment step for gold recovery from auroferous pyrite concentrate. CIM 81:910. Hughs, M. N., and R. K. Poole. 1989. 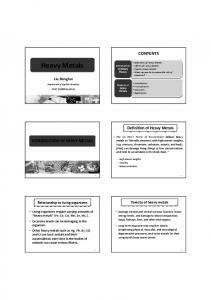 Metals and Microrganisms. London: Chapman and Hall, 303–357. Kaleli, H. A., and M. R. Islam. 1997. Effect of temperature on the growth of wastewater. Bacteria. Toxicology and Environmental Chemistry 59(1–4):111–125. Khoshmanesh, A., F. Lawson, and I. G. Prince. 1995. Cadmium uptake by unicellular green microalgae. Chem. Eng. J. 62:81–88. Khoshmanesh, A., F. Lawson, and I. G. Prince. 1997. Cell surface area as major parameter in the uptake of cadmium by unicellular green microalgae. Chem. Eng. J. 65:13–19. Khummongkol, D. 1982. 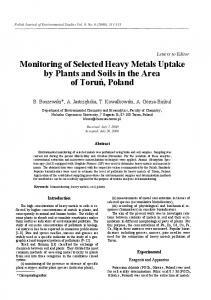 Uptake of heavy metals by microorganisms a model approach. Ph.D. Thesis, Monash University, Melbourne, 1982. Ledin, M., and K. Pederson. 1996. The environmental impact of mine wastes—Roles of microorganisms and their significance in treatment of mine wastes. Earth Science Reviews 41:67–108. Leighton, I. R., and C. F. Forster. 1998. The effect of heavy metals on a thermophilic methanogenic upflow sludge blanket reactor. 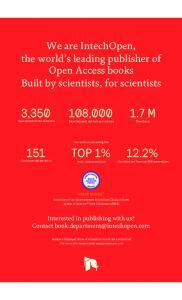 Bioresource Technology 63:131–137. Livingston, R. J. 1994. Bioremediation of long chain hydrocarbons. M.S. Thesis, Dept. of Geology and Geological Engineering, South Dakota School of Mines and Technology, 122 pp. Maeda, S., and T. Skaguchi. 1990. Accumulation and detoxification of toxic metal elements by algae. In Introduction to Applied Physiology, I. Akatsuka (ed.). The Hague: SPB Academic Publishing, 137–149. Marsden, J. 1992. The chemistry of gold extraction. Ellis Horwood Ltd, 21–23:5. Moffet, A. S. 1994. Microbial mining boosts the environment, bottom line. Science 264(May):6. Seeley, H. W., Jr., P. J. Vandemark, and J. J. Lee. 1991. Microbes in Action. New York: W.H. Freeman and Company. Sterritt, R. M., and J. M. Lester. 1996. Heavy metals immobilization by bacterial extracellular polymers. In Immobilization of Ions by Bio-sorption, H. Eccles and J. Hunt (eds.). London: Chemistry Society, 121–134. USEPA. 1986. Drinking water in America: An overview. EPA Journal 12(7):14–15. USEPA. 1987. The Hazardous Waste System, Environmental Protection Agency. Washington, DC: Office of Solid Waste and Emergency Response. Wilde, E. M., and J. R. Benemann. 1993. Bioremoval of heavy metals by the use of micoalgae. Biotechnol. Adv. 11:781–812. Zekri, A. Y., and O. Chaalal. 2000. Biodegradation of oil spill under United Arab Emirates conditions. SPE 61474, Proc. SPE, Norway. 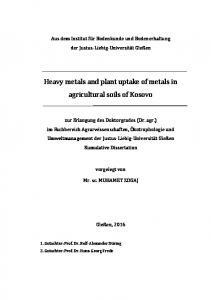 Report "Uptake of Heavy Metals by Microorganisms: An"